In a previous article, I suggested improved stylus support would help the iPad gain everyday usability in the hospital and work place. The iPad already supports styluses, but the multi touch capacitative technology which makes the screen extremely responsive to human touch also makes it less sensitive to fine-tipped styluses. As a result, the iPad currently only supports blunt-tipped styluses, much like the tip of a Sharpie marker. For the time being, many companies sell these thick-tipped styluses that offer basic pen-like interaction for writing and drawing on the iPad. Unfortunately, there are many different form factors and designs that make selecting a stylus difficult, especially when most of these products are only available online. This comparative review of seven iPad stylus pens will attempt to focus on the handwriting and usability of the various styluses currently available. The iPad styluses reviewed are: Griffin Stylus, AluPen, BestStylus, Boxwave Styra, Pogo Sketch, Stylus Sock, and Dagi Stylus. Gathered below are my thoughts on seven individual styluses, sorted alphabetically, that I’ve gathered over 2-3 months of use. For some objectivity, I ran three primary tests of handwriting that set the foundation of this review. 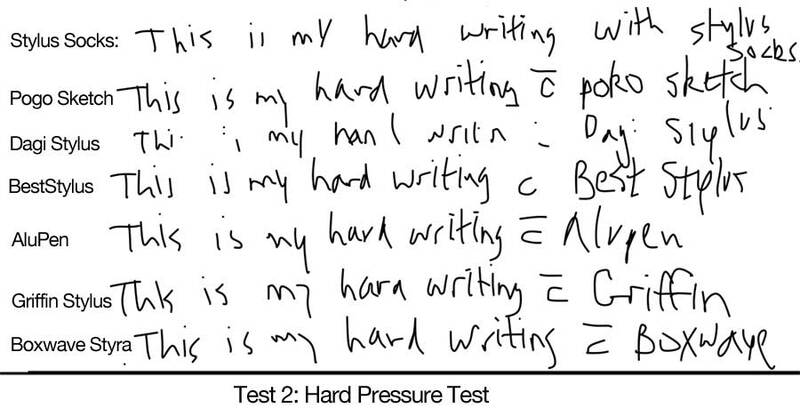 In the first test (The Light Pressure Test — below picture), I tried to write as quickly and as naturally as I would write, as if I was using a pen. This was by far the most sensitive of the tests. The second (Hard Pressure Test — below picture) was where I tried to write with more pressure, in effort to improve the detection of the tip. As you can see, the quality of the writing is not particularly impressive in the first two tests, as the thickness required for the iPad to recognize the stylus leads to sloppy writing. The third test was done using the Zoom Mode feature. This last test looks remarkably more crisp and impressive thanks to the Zoom Mode feature. The Zoom Mode feature is one that many of the top-tier notepad applications provide (be on the lookout for my “Handwriting Notepad App Comparison” review in the upcoming weeks). In this mode, you write in a box at the bottom of the screen that is a zoomed in view of the writing area. Therefore, you can write large and clearly, and when scaled back down, the handwriting is many times more legible and tightly spaced. While the end result is clean and impressive, it can become a bit clumsy working in Zoom mode. This last test (Zoom Writing mode — below picture) showcases the writing with each stylus in this mode. Great article, valuable advice for students as well. You guys never cease to impress. thanks. i’ll try to get that corrected asap. sorry about that! Hi David, really great review. Been using 3 types of pans. Most useful is AluPen. But the rubber bit bigger. The great thing is that it made of aluminium, it’s have and helps. My use of the pen is for drawing and writing. Didn’t find yet better one. I use the pogo stylus with Penultimate. I think part of the issue with styluses has to do with the design of the handwriting app in which they are used. I could not replicate the poor performance of your pogo in Penultimate. Even with a very light and quick touch, I get good results. I hope you’ll include this app when you review handwriting apps. In my opinion it is by far the most elegant way to turn the iPad into a piece of paper. I’ve pretty much eliminated paper note taking with this combo. This said, I really appreciated the review of styluses. The pogo isn’t perfect and I like knowing what else is out there. Thai you. This is very helpful. I got an Acase but the tip is so soft it does not work properly. I have to press really hard and at a 90 degree angle to write, but the scribbles are so bad that I cannot understand my notes afterwards. I like the Alupen, but it is a bit thick. My most used is the Hard Candy stylus/pen, though some complain that it is too heavy. It is, but that is good for me because I can hear it when it hits the floor after falling out of my pocket. I’ve made several home brewed styli, and should just buy some conductive foam/cloth. I’ve used stripped out metal pens and artsy charcoal / chalk holders. Even wood often works as a holder and can be made more conductive with a wrap of bare wire. Some brands of kitchen sponge are conductive, but I find they dry out after a while and then get flaky. My latest fix to most of my styli (which are usually aluminum) is to add a thin strip of magnet or ferrous metal so they stick to my iPad2 Smart Cover! This ones are for newbies. There are professional styluses that can really make the difference. I have a ZeroStylus Pro, a bit expensive but does all the work. From the three I’ve tried I like the Boxwave the best and it has great reviews on Amazon too. It’s great to see all the example writings side by side like this. Very helpful review. I’ve been using the Boxwave stylus for about 8 months…well I’ve been using three of them. They seem to have a limited life span. The rubber becomes …contaminated…for lack of a better word and it no longer writes smoothly. I originally purchased two of them, when the first one started to loose it’s “smoothness” I returned it under warranty and Boxwave sent me another. The second stylus started to loose it’s smoothness shortly afterwords and but Boxwave would not exchange (90 day warranty ran out) they suggested I try cleaning it with a mild detergent….Didn’t work. Now the third stylus (The replacement) is loosing it’s smoothness. Has anyone else run across this phenomenon? Any suggestions on cleaning? Any one make a stylus with a better warranty? Thanks David, I was particularly interested in your review of the STYLUS R US. I purchased a stylus from them and I also received many peculiar ( that’s an understatement) emails. I agree with your review, but I would not buy from that Company again. Thanks, this is very helpful. I have been researching which tools would be the best for note taking and it seems the PenUltimate and a Griffen Stylus will suit my needs just fine. Thanks for taking the time out of your very busy schedule to research and document all of this, it’s a great help! Would be great to add the SGP Kuel H10 to the article. I am considering getting it because of it’s extension feature. If you are using the zagg i don’t recommend you the use of this rubber point stylus. I was using the targus stylus with a non glare screen protector of the same brand and works perfect, but then I want to use a non antiglare screen protector and i choosed the zagg. the results are really bad, theres a lot of friction and dont let you write smoothly. believe me! I’ll opt to remove the zagg. I just purchased the Toshiba Thrive and installed the Zagg screen protector. Today I purchased the Dagi stylus. It writes very poorly. It drags across the screen, skips and doesn’t work very well at all. I presume they all will have the same problem due to the Zagg screen. What is your writing like with paper and pen. That comparison with all the others would have been helpful. There is a link that David posted within the comments section here to address that: http://i.imgur.com/2Qsfi.jpg Hope that helps! I have a patient that lost her hands to sepsis. we bought her two styluses to use on her iPad, and she would use them by tucking them into a Velcro cuff around one of her stumps. We found one of them needs to have contact with skin to induce an electrical current to make it work, and the other did not. 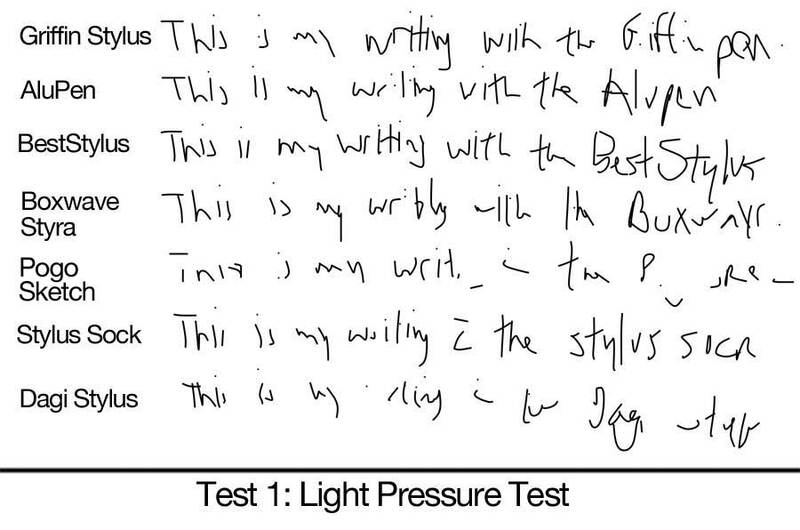 of the styluses that do NOT require skin contact, which produces the best handwriting? Thats an interesting use of a stylus, and one that I’m sure your patient appreciates. 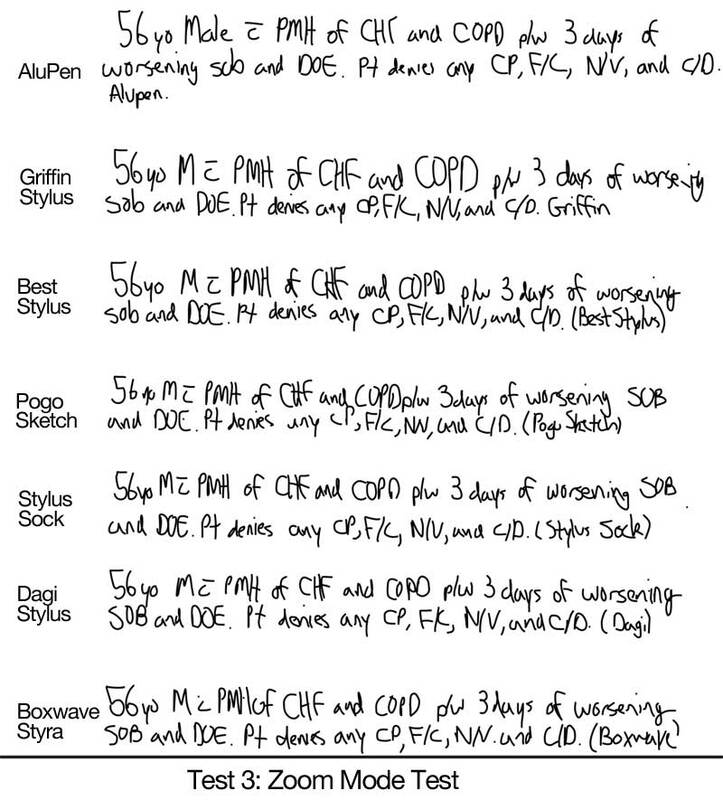 Which styluses did you you experiment with, and which one worked without requiring the patient’s touch? Thank you for the review. I’ve used the Griffen and (a different) Boxwave. I’ve enjoyed them both, but they seem to lack durability. They seem to become more adherent over time and the rubber seems to break down pretty easily. I was going to use some silicon spray on my most recent, but it started breaking down before I got the chance. BTW, the “Zero Stylus Pro” looks completely awkward. Was that the proprietor recommending it in the comments below? I just received shipment of a Kickstarter project from Adonit (adonit.net) of the Jot Stylus. I’ve used the Pogo stylus (several of them), some cheap styluses from eBay, and a Griffin stylus. To this point, the Griffin has been my favorite…but the Jot Pro that I just received absolutely blows them all away. It’s a heavy stylus (like a good pen, and also like the Griffin), but the unique disc feature allows for great control, especially with an app like Noteshelf that allows for magnification of where you are writing. As you look at these styluses, you also need to consider the Jot. It’s iPad changing. Chris, let us know your thoughts when you’ve had a chance to test the Jot Stylus, it looks very promising! I would like to thank you very much for the interesting test with all these styluses that you are performed. Thank you for your fine review. This was needed. The Jot and Jot Plus are excellent and the accuracy is great! I prefer the Plus since it has the rubber grip which makes holding it easier and writing even more precise. Best for fine line work like drawing. For my money the iFarraday stylus is the best stylus on the market. I have no idea what the material is, but it’s neither rubber nor foam, both of which are just terrible for the smooth gliding needed for handwriting on the iPad. The iFarraday uses a fabric of some kind, and there are many options for firmness of the tip, as well as type of metal barrel. The guy who makes the iFarraday is just an individual, so his inventory is limited, and expect to pay a premium ($15 to $20 for the base model), but it’s worth it. Why can’t I use a stylus from my old unused pda? Or, the round tip from a capped pen? Because modern touch screens use capacitance, so the stylus has to be made of conductive material (it essentially becomes an extension of your hand, electrically). I have a Griffin and use it, or try to use it, for drawing and the large nib is a true hindrance, not being able to see around it. A fine nib would be wonderful. The nature of capacitance, the technology used to locate the nib, or a finger, is relative. And lastly, and I really don’t know the technological impact, but having a oleophobic film on the screen can’t help. Then there’s the longevity of dragging a nib across the film. Obviously there’s room to grow. Thanks so much for the reveiw! any rcommendations on a stylus for note on ipad that has ZAGG protector? Nice review but you badly need a summary page (all reviews should have a summary page). I had to keep clicking back and forth between your pages and nearly gave up trying to figure out what was best about each. I would have liked to see a picture of the same sentence written on normal paper with a normal pen, so that I could compare missing elements of it in the digital sentences. But very detailed, and meticulous review! Thanks. I agree. Very detailed review. However, adding the missing piece of handwriting would have given the article more objectivity. Well done and thanks! Thanks so much for this. I am currently awaiting the arrival of my first iPad. I am looking into stylus reviews as I will be using my ipad to take notes at uni lectures, so will need one which makes this easy. Even tho i’m fairly green to all this, I can’t help thinking that the pen is dependent on the note taking app and vice versa, together with the tablet sensitivity itself. Hopefully it will all work out for me. I was only able to find this kickstarter link, not a main site. i have just bought a stylus for my iPad, i found that the soft thick tip has caused much resistance while writing, it’s rather inconvenient. I m not sure if it’s the problem of the stylus or the screen protector as i only bought the stylus months after the screen protector. What’s your opinion on this issue and is there any better stylus with low resistance to be recommended? I just started using the Bamboo stylus with Wacom’s free application and Penultimate on the original iPad. While I am interested in drawing, I mostly take notes. I just wrote a small test page and got about three to five words per line and maybe about a dozen lines on the page. This just doesn’t seem very practical. I am going to look for a different stylus that has a finer tip to see if it helps. With both applications, I selected the narrowest tip (each had 3 choices). I also had used a Lenovo Thinkpad tablet with the included stylus. It had more of a real notebook page. The Lenovo also has a much higher resolution display so maybe that is how they are able to provide a nicer interface. Is there a good writing stylus available? I wish I had an opportunity to try the Thinkpad tablet’s stylus with the iPad. Just a little information I rigged up my old fine point stylus from my touch screen think pad. I simply put a piece of foil from a gum wrapper on it to see it would work. To my surprise it performed better than any stylus I have tried and I have tried several. Given that why can’t apple make a fine point stylus? A project just started on kickstarter.com. It’s a site for entrepeneurs, artists..etc to get funding to bring their idea to fruition. The Hand Glider was created for users of electronic tablets and stylus. In a nutshell, when writing or drawing on an iPad or other tablet the user has to prevent their hand from making contact with the tablet or they will make erroneous marks and/or compromise the effectiveness of the stylus they are drawing or writing with. ITS NOT NATURAL OR COMFORTABLE. The Hand Glider allows full contact with the tablet so the user can write normally. For full details follow the URL below or go to kickstarter.com and search Hand Glider. It would have been even more helpful if the author would have compared these writing instruments to his personal hand writing as it appears on a piece of paper. That said the article is quite helpful for those of us who wish to use a tablet for its mobility and have chosen the iPad for its stable OS and wide variety of Apps. What nobody has mentioned is the handicap of being left-handed. Using my right hand, which is incapable of writing coherently, any of these thick-tipped pens are good – I can see the track of the writing. With my left hand, it is near impossible to see my own writing – if you are a pen producer, please, please refine a thin tip so left handers can actually see why they are writing! My wife is left-handed and, for fun, writes from right to left producing mirror image text as quickly as she writes from left to right. She can read it quite easily but I can’t. If she used a stylus on a tablet it could easily be flipped for lazy readers such as myself. I’m left handed too, and from the generation that had to write at school with smudgy pen and ink, so I was clipped around the ears almost every day. You can understand why I do not like writing with a pen. This is why I blessed my first mac in 1984 but now I have opted for dictation. My iPad happily understands my UK English quite well and only a little finger typed correction is necessary. I’m writing this comment about twice as fast using dictation as if I had only used finger typing. Some say they manage about five times their normal typing speed. The main hurdle for me seems to be that my brain has to adapt to producing written text using my voice. I have used Toshiba computer touch screen for years with fine tip stylus for medical reasons- now switched to ipad3. I haven’t bought a iPad pen yet . does anyone use the built in speech to text on iPad 3 and how accurate is it in voice recognition accuracy ( faster) compared to the styluses. ?